Our wedge pillow is available on our quality white or ecru pique fabric with a 3-side zipper close. Pillow is 11" high and 16" long. Great for reading, studying, watching TV or just.. Whether you're redecorating home or you're looking for a unique gift idea, our personalized pillows and pillowcases allow you the opportunity to create something classic and unique. Our pillows and pillowcases come in different shapes and have unique and fun custom imprints. Some also feature an imprint or design on the back of the pillow. Our softly textured fabric is long-lasting, wrinkle-resistant and feels as great as it looks and easily accommodates an optional standard sized pillow insert. Our university and collegiate pillows are officially licensed 17" square shapes featuring a collegiate desig embroidered on front of pillow. Pillow is corded and backed with a matching cotton fabric. And, our pillows are made in America. Our study wedge pillow makes a great birthday, graduation or Christmas present and is available on our quality white or ecru pique fabric with a 3-side zipper close and makes a wonderful gift for any student or adult as it's great for reading, studying, watching TV or just relaxing. select the thread color for the embroidery of a monogram or name. 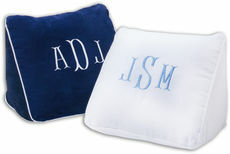 For a lovely bridal or wedding gift, choose our Mr. and Mrs. rectangular pillowcase gift set. The imprint is on the front, with a luxurious sateen fabric on the back. These pillowcases fit standard and queen sized pillows. Our handmade knit heart pillows are a fun gift for the special child on your list. 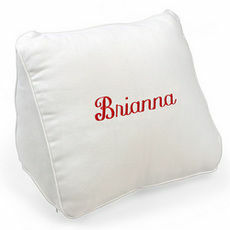 They're available in various colors and patterns, and you can have the child's name stitched into the soft acrylic pillow front. These sophisticated knit pillows are handmade and sized a generous 15" x 15". You select typestyle, background and accent color as well as design surrounding a monogram or name. To memorialize some of life's most precious and festive moments, you can upload your favorite photograph and we will create a pillow out of it. This could be a touching way to celebrate special times such as a wedding or the birth of a child. For a housewarming party or an update to your own home's decor, choose from our monogrammed pillows. The sports fan in your home or on your gift list will appreciate our large selection of fan pillows. Choose from your favorite college teams. Our pillows measure an ample 15 square inches and have vibrant colors. Pillows make a great gift for many occasions from graduation to Father's Day to new baby gifts and birthdays. There is a wide selection and all the items are produced with quality and care.